It’s a new year, and, now that I’m finally starting to settle down after my monster move, I’m back on Day By Day Writer. I’m excited and pledge that I’ll be with you at least three times a week. So, with the new year comes good news and bad in the publishing industry: Borders is still in financial trouble and delaying payments to vendors in a short-term effort to fix things. But on the upside, both Amazon and Barnes & Noble reported strong sales of their ebook readers, the Kindle and Nook, respectively. Amazon says 2010 Kindle sales were at more than 8 million units, with B&N claiming “millions” of Nooks were sold. I can attest to this, as I had a hard time finding one this Christmas. Although a paper-book lover, I definitely see the benefits of going digital. Aside from the obvious benefit to trees, e-readers are great for avid readers who travel a lot. My father is one of those. He makes long trips a few times a year, and on those trips, he carries a good four or five, maybe more books. And I’m not talking about little thin books. When he left my house a couple days ago after the Christmas and New Year holidays, he left with me the James Bond Union Trilogy — a three-book pack — because it couldn’t fit in his suitcase. He had another three books already in there! For people like my dad, an e-reader, at a little more than 8 pounds for the Kindle, is a great idea. And although we had had conversations about how we both preferred the feel of paper, I took a leap and bought an e-reader for my dad for Christmas. After much research, I chose the Kindle, but both Best Buy and Target — all my local stores — were completely sold out of the devices when I was shopping, proving their popularity. Amazon happily sent one my way, however, and my dad was surprised and pleased. A gadget lover, he quickly loaded it up with his favorite books, and I caught him reading his Kindle on the couch a few times before he left. Next time he flies across the world, his suitcase will be a lot lighter, but he’ll be able to carry with him many, many more books to enjoy. 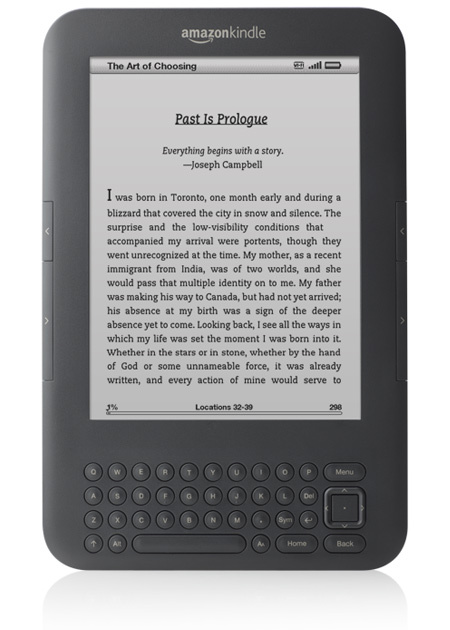 The popularity of e-readers is great news for publishers and us writers. Book sales have been waning the last few years. But, if people like their e-readers, they’ll want books to read on them. And good books are good stories no matter whether they’re printed on paper or e-ink. So, this year, keep up the writing. E-reader lovers need more stories. It’s quite a big decision – surprisingly so – to go digital, as you put it, because paperbacks are so endlessly charming. But I finally bought a Kindle a few months ago and I couldn’t help being quickly converted to the usefulness of it. Travel is definitely one of the biggest advantages. I fly regularly myself, and it is wonderful to be able to keep space in my suitcase for actual clothes and still have plenty of reading with me. It’s quite important to own one to keep up with the new trends in publishing, also. We’re now seeing publishers releasing books only in e-book format, for a start, along with a lot of short fiction mags for the same; and there’s a growing and pretty good crowd of authors essentially self-publishing for Kindle. I love the fact that I can browse these and pick up some good reads that publishers might not have looked twice at. That opens up some interesting new possibilities for the writers among us, of course. It’s worth keeping an eye on how it all develops in the next few years. That’s interesting that you’re a Kindle convert too, Charlotte. I don’t travel much, but I told my husband I’m interesting in getting one partly so I can more easily read while I’m walking our dog. Books getting heavy walking that long! And the self-publishing aspect is an interesting topic. It’ll be interesting to see how it all shakes out for writers and publishers. It is certainly changing the landscape of publishing. As a writer, I strongly recommend readers buy their books in both formats. That would be good, Tom. I just read in the Publishers Lunch enewsletter today that 19 of the top 50 USA Today bestsellers sold more ebooks than print versions, and apparantly, it’s the first time more than two books in the list have had that distinction. Also, Half Price Books is going digital. My question about that is, will they be selling used e-books? And if not, will they be giving the authors royalties, like they’re supposed to? Hope so. Interesting point of views. I must say I’m not there yet, but I am sure one day I will get a digital reader. Thank you for your post.